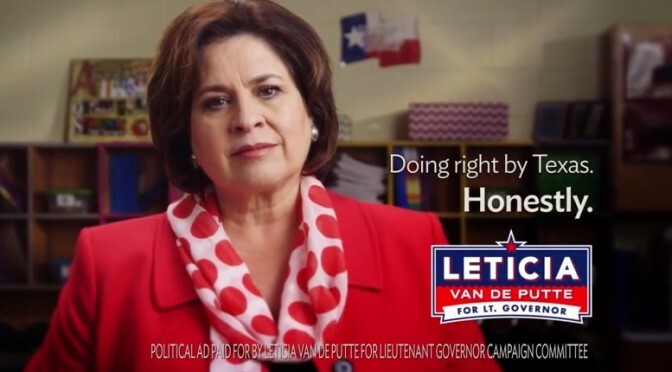 San Antonio, TX — This weekend, Leticia Van de Putte is releasing her first two television ads, one in English and a separate ad in Spanish. The 30-second spots are a significant buy in multiple major media markets, as well as markets with a dominant Latino population. In “Twice,” Leticia Van de Putte directly calls out Dan Patrick, who voted twice against our kids. Patrick’s cuts to our neighborhood schools in 2011 resulted in the loss of 11,000 teacher jobs. In 2013, Leticia worked across the aisle with many Republicans to put Texas first and support our students. Despite bipartisan support for our neighborhood schools, Dan Patrick voted against our kids — again. In “Respeto,” Leticia Van de Putte shares about the respect that every Texan deserves. Leticia introduces her immigrant grandmothers; as well as the service of her mother, a teacher, and that of her father, a veteran. Texans never give up, and Leticia — a mother of six, grandmother of six, pharmacist and a State Senator — commits to continue the fight to protect the future of our kids. The aspirational nature of “Respeto” speaks deeply to a community whose voice has long been lacking in Texas statewide politics. “Twice” does a great job of straddling the lines of presenting negative information on the opponent, while managing to be a net positive ad. Touting her strong bipartisan record and unique family story, these ads seem to have all the right ingredients for success. With six weeks to go before the first votes are cast, it’s impossible to predict just what kind of impact will be had from these spots. But by getting out ahead of her opponent Dan Patrick with strong ads, Leticia has assured that the first “big move” is hers. 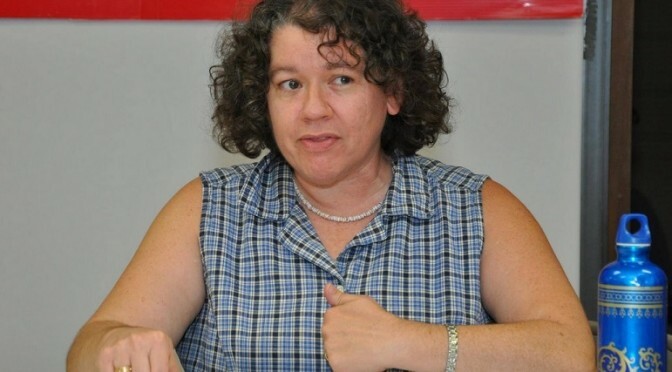 In the First installment of the 2014 Texas Leftist Candidate Questionnaire, we hear from Laura Nicol, candidate for the Texas State Representative, District 133. She is a Democrat. LN: Government’s job is the protection and empowerment of ordinary people and their communities. Protection from natural disasters, accidents, and predators (animals, people, and businesses). Empowerment via infrastructure, institutions, and programs that anyone can use to achieve success. Workers need a living wage, humane working conditions, and affordable housing near public transportation. Families need wholesome food, health care, and social services within their community. Neighborhood schools need full funding and the freedom to teach. Immigrants need legal options and an efficient path to citizenship. LN: As State Representative for Texas House District 133, I will fight for full restoration of funding for neighborhood schools, and distribution of resources according to need, not test scores. I will champion legislation to require every job to provide a living wage, decent working conditions, and regularly scheduled days off. I will fight to protect communities from endangerment and exploitative business practices by enforcing regulations, requiring independent inspections, and imposing crippling penalties for repeat infractions. If necessary, I will push for a state income tax to fund these measures. LN: Yes. If there is suitable existing legislation, I will vote for it. If not, I will submit a bill. In addition, I will join other advocates in publicizing the benefits and debunking the feared consequences of Medicaid expansion. LN: Infrastructure is what individual prosperity is built upon. But infrastructure rests upon the foundation of environmental health. Water, air, and soil are our most fundamental and essential assets. Environmental protection regulations must be enforced and continually updated to include new data. Natural resources must be managed for the good of all, not the profit of a few. Once the foundation of environmental health is secure, civilization’s infrastructure can be addressed: education, health care, housing, transportation, etc. All must be addressed with the intent to provide the most good for the most people in the long run. There are fact and evidence based solutions already working out in the rest of the world; we should not let profiteers call the shots. LN: The incumbent is a business man, not a public servant. He is wealth oriented, stuck in the profit paradigm where money matters most. He brags about how many private schools are in his district, and voted to both reduce and divert public education dollars, starving our neighborhood schools for the benefit of exclusionary institutions. I am committed to the health and well-being of all Texas residents; I believe every neighborhood needs good public schools, affordable housing, accessible health care & social services, reliable public transit, and a variety of small businesses providing goods, services, and living wages. We all do better when we ALL do better. LN: Although I no longer sing in a choir, I still lead hymns at my UU church every Sunday. I read a couple of hours a day. The exception is when my children coax me into trying out a new video game, which I will play for a couple of months before losing interest. Several times a year I like to spend a day in the garden, focusing on plants and dirt; it puts everything else into perspective for me. Thanks to Ms. Nicol for her participation.